Mark Twain was one of the most prolific and acerbic commentators on religion and politics in his time. His words are remarkably relevant to today’s headlines, more than 115 years after his death. He also knew how to poke fun at himself – a refreshing talent sadly lacking in most public figures today. 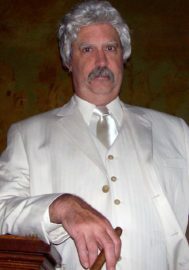 Join us Monday, April 1 at 6:30 p.m. as Jim Ketcham performs as Mark Twain, using Twain’s own words to describe, “the whole damned human race.” This free event will be held in Taylor’s Woodside Building and is open to the public.